Chimney Swifts once nested and roosted in hollow trees in old-growth forests. When European settlers arrived, they greatly increased the number of potential nesting sites for swifts by putting chimneys on their buildings. Now, Chimney Swifts only occasionally use trees. These twittering, “flying-cigar” shaped gray birds are easy to identify as they fly over cities and suburbs catching flying insects. Chimney Swifts are most noticeable at dusk during migration when flocks numbering in the hundreds or thousands circle in tornado-like flocks above roost-chimneys and then suddenly descend, like reverse smoke, into the chimney to spend the night. Chimney Swifts breed in the eastern half of North America and winter in South America. They usually arrive in Tennessee by late March and depart by mid-October. The name “chimney sweep” is still commonly used. Description: Chimney Swifts are uniformly dark gray with long, narrow, curved wings, and a short tail, that is not obvious in flight. They are rarely seen perching. Male and female are alike in plumage. Voice: A high-pitched musical twittering given in flight. This is the only swift commonly found in eastern North America. Swallows have broader triangular shaped wings, and a noticeable tail. Habitat: Nests in variety of habitats, especially common in urban areas. Forages over open areas. Nesting and reproduction: Only one pair will nest in a chimney, but unmated helpers may assist, and non-breeding individuals may also roost in the chimney at night. Information about building a chimney. Clutch Size: 4 or 5 eggs, range from 3 to 6. Fledging: Both parents feed nestlings, which often leave the nest when 3 weeks old and cling to the chimney wall for a week before being able to fly. Nest: Both parents build a half-cup of loosely woven twigs, cemented together and to the wall of the chimney, with the bird’s glue-like saliva. Pairs often use the same nest site in subsequent years. Status in Tennessee: Common migrant and summer resident across the state, but most numerous in urban and suburban areas. They are present in Tennessee from late March or early April until mid-October. The population is declining rangewide, possibly because new style chimneys are less suitable for nest sites. The wintering range of the Chimney Swift was not discovered until 1943, when 13 bands were recovered from Indians in Peru. Eight of these bands came from birds that were banded in Tennessee. Over 108,000 swifts were banded in Tennessee between 1928 and 1944 at banding stations in Chattanooga, Knoxville, Nashville, Clarksville, and Memphis. Chimney Swifts do not perch like other birds. They use their long claws to cling to the walls of chimneys, and use their stiff tail feathers as a prop. 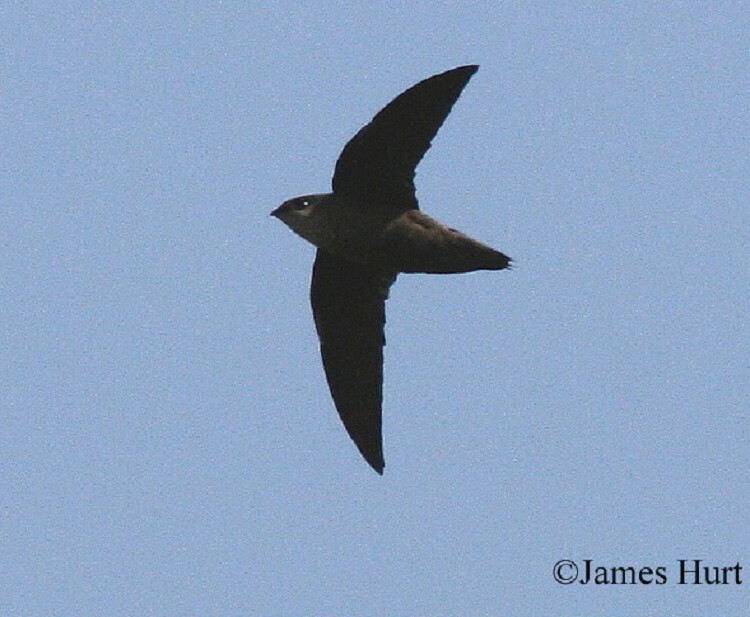 Swifts spend their entire day in the air except when roosting or nesting. They even bathe in flight by swooping down and touching their breast feathers on the surface of the water. The sound of swifts in a chimney sometimes causes alarm among homeowners, but by the time the calls of the nestlings are loud enough to be heard the nestlings have only a week or two before they will fledge. There will be only one active nest in a chimney, but a “helper” adult may also be present. On occasion, non-breeding individuals may roost in a chimney with an active nest. The oldest known Chimney Swift in the wild was 14 years old. Best places to see in Tennessee: Chimney Swifts can be found in urban, suburban and rural settings statewide. Cink, C. L., and C. T. Collins. 2002. Chimney Swift (Chaetura pelagica). The Birds of North America, No. 646 (A. Poole and F. Gill, eds.). The Birds of North America, Inc., Philadelphia, PA.